Bowie fans always celebrate David Bowie this week as not only is it the week of what would have been his 72nd birthday but sadly also the 3rd anniversary of his death. But David Bowie’s legacy is a wealth of songs that live on in our hearts. What better way to celebrate him than to attend A Bowie Celebration? 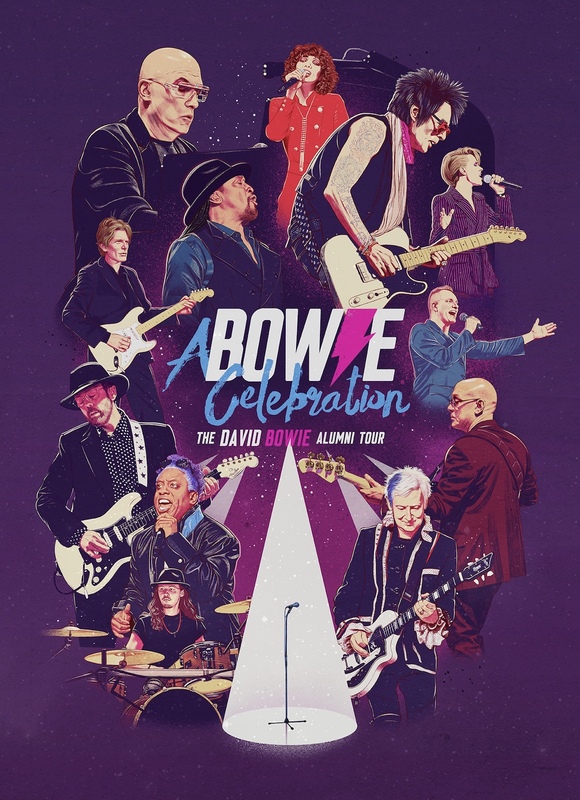 A Bowie Celebration consists of a number of Bowie’s band members including the legendary Mike Garson, Gerry Leonard and Earl Slick. There has been a gathering of band members in previous years under the title of Celebrating David Bowie which previously had mixed reviews, but this has now split into two separate groups with the majority of the Bowie alumni now playing for A Bowie Celebration. For those who may have seen the previous incarcerations, let me say that A Bowie Celebration is a slick and professional affair and has none of the previous issues that fans may have experienced. Mike Garson is not only an accomplished piano player but also a long-time member of Bowie’s band so is also the perfect person to host the night. He comes onto the stage to a rapturous applause after saying, “Good evening London. David wrote the greatest songs and we are keeping them going. This is a celebration of those songs sung by this generation”. Mike has had a difficult year as his house and possessions were a victim of the fires in California, but tonight, that was all put aside as he tells us the story of when he and Bowie played Glastonbury in 2000. It’s relevant with the recent release of the Glastonbury 2000 DVD and CD. Mike tells us that before Bowie went on stage, he was nervous and asked Mike to ‘warm up the crowd’. So, Mike played them Greensleeves. He played that for us tonight. These stories of Mike and David give the show a prestige that others cannot provide. A real quality and personal connection with Bowie himself. He introduces Bernard Fowler who comes out to sing Bring Me The Disco King. This is a brave choice of opening track for two reasons. Firstly, it is a slow ballad when most musicians would open to something upbeat, and secondly it is not a well-known ‘Best of Bowie’ song for those who only know the greatest hits. Bernard is outstanding and with his soulful vocal range knocks it out of the ball park. It’s a fantastic start to an exciting evening being followed up by Bernard doing Rebel Rebel which has the audience singing along. Bernard is truly outstanding on all the songs he delivers but when he sings Win (From the Young Americans album) it absolutely sends shivers down my spine. I was not expecting such a wonderful album track to make the set list so was delighted with this. Bernard made my evening with this and followed it up with Station To Station with guitar support from Legendary Earl Slick. This was just a joy to behold and delivered Station To Station with pace and perfect execution. You couldn’t ask for more than this. Bernard isn’t the only vocals this evening. We are also lucky to have Corey Glover, founder member of Living Colours who has an amazing voice and his version of Aladdin Sane with Mike on Piano was one of the outstanding pieces of the evening. Mike on this track was in his element with improvs snippets of other songs including Time which got a huge roar of recognition from the audience. Our third vocal this evening was Joe Sumner. Yes, it is Sting’s son but he doesn’t need that title as he is a talent in his own right. His version of Ziggy Stardust was punchy and pure rock n roll. Exactly how it should be played. Bowie would have loved it. Joe’s version of All The Young Dudes had the audience all waving their arms and singing along. It was wonderful. Earl Slick wasn’t the only legendary guitarist tonight. We also had Gerry Leonard who joined Earl, Bernard and Corey for the classic Under Pressure. Not an easy song to deliver but this was another highlight. Gerry came out for an encore to deliver a solo of Andy Warhol on his guitar. It was simply perfection and the crowd really appreciated it. The classic track to end on is always Heroes and sure enough we were watching some real heroes tonight delivering an evening that will live in our hearts for months to come. Forget all the celebrations that have gone before – this is the real definition of celebration and even our mainman, David Bowie would have had a blast!